Appointment in Samarra staged a success. It had a crisp, vitality that carried over without the aid of the "modernisms" of vocabulary and dialogue which -- doubtless -- swelled the ranks of the readers with the commentary they aroused. 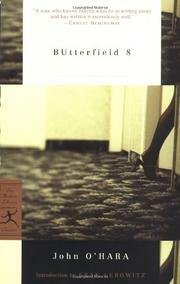 Now comes Butterfield 8 -- distinctly a metropolitan area novel, and teasingly reminiscent of the scandal unearthed (and quickly sidetracked) by the papers in the unsolved Starr Faithful case. Pretty rough -- this story of a girl about town, of her start on the downward career at the age of 12, of the cross sections of her various liaisons in New York, of the sordid finale on the Boston night boat. A bit more on the "cheap" side than Appointment in Samarra -- and O'Hara doesn't need to be cheap, for he has the gift of making his people and situations real. But -- it will sell, and rent.